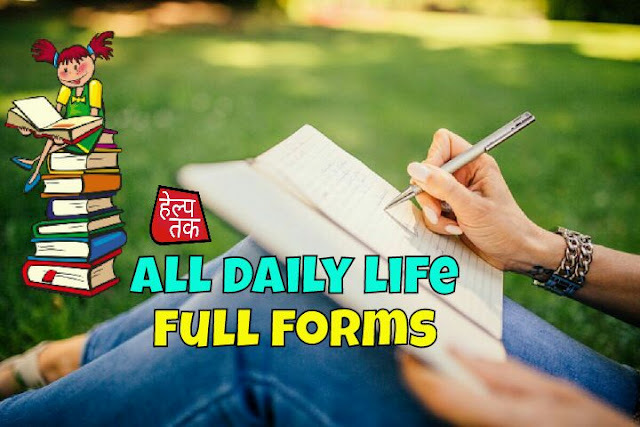 Hello Friends, aaj ki is post me main aapko 150 Abbreviations jise hum Full Form bhi kehte hai ko batane ja raha hu in abberviations ( full form ) ko hum apne daily life me hamesa sunte or bolte hai magar aapko in words ki basic full form pata nahi hai to is post me aapko abbreviations for words or general full form list provide karne wala hu aap in some important full form pad ke apna general knowledge increase kar sakte hai. DNA – Deoxyribo Nucleic Acid. PTO – Please Turn Over. AM/PM – Anno Meridian/Post Meridian. BPO – Business Process Outsourcing. DSLR – Digital Single Lens Reflex. NEFT – National Electronic Funds Transfer. CTC – Cost To Company. PAN – Permanent Account Number. PDF – Portable Document Format. IAS – Indian Administrative Service. PNR – Passenger Name Reference. VIRUS – Vital Information Resources Under Seize. To Guyz Kesi lagi aapko ye all daily life Abbreviations ( Full Form ) ki list or aapko kuch or daily life ki full form pata hai to comment kar ke hame jaroor btaye.